According to the link, only three sites were targetted. 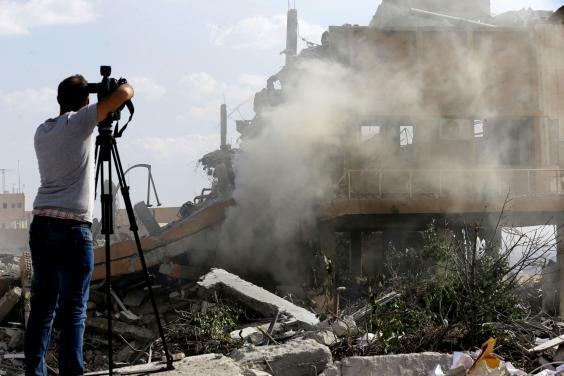 The governments of the US, UK and France say 105 missiles were launched at three sites in Syria as part of a coordinated operation early on the morning of 14 April, at around 4am local time. They fired about 100 missiles on these three sites which appear to be demolished. Do you have any idea of what 105 missiles would have done to three sites?!... Do you think the US/UK/France would have targeted 105 missiles to three sites? What an incredible waste of explosives would that have been!!!... No. They are just trying to disguise the fact that 70% of their missiles were intercepted... Embarrassing it may be, but that's also what happened. Do these fotos seem to you as showing buildings having been hit by over 100 missiles? Last edited by Sertorio on Sun Apr 15, 2018 6:03 pm, edited 1 time in total. Yeah. 105 missiles destroyed the three sites. Do you think the US/UK/France would have targeted 105 missiles to three sites? What an incredible waste of explosives would that have been!!!... No. They are just trying to disguise the fact that 70% of their missiles were intercepted... Embarrassing it may be, but that's also what happened. How many missiles are required to destroy three sites? It depends on how large the sites are and how destructive each missile is. I don't have information on how large they are and what area can one missile destroy. Do you? I don't think so. How many sites do you think 105 missiles were aiming for? If 105 missiles were targetting three sites as reported, that is an average of 35 missiles per site. If 70% were destroyed before reaching the target, then about 11 missiles hit the target. If it is five sites, then each site would have been targetted by 21 missiles. If as you say, 70% were destroyed, then that still means each of the give sites was hit by about 6 missiles. How much damage can 6 missiles do? I don't know the answer, but there still will be damage. So the newspapers will be showing pictures of damage done to 5 sites instead of 3. I, therefore, believe that only 3 sites were targetted. How many, if any, were destroyed by Syrian defenses is not known. The Russians said 71, and seeing the extent of the damage shown, I tend to think they are right. But of course the Americans will never recognize that, as it would show a high degree of unreliability of their missiles. 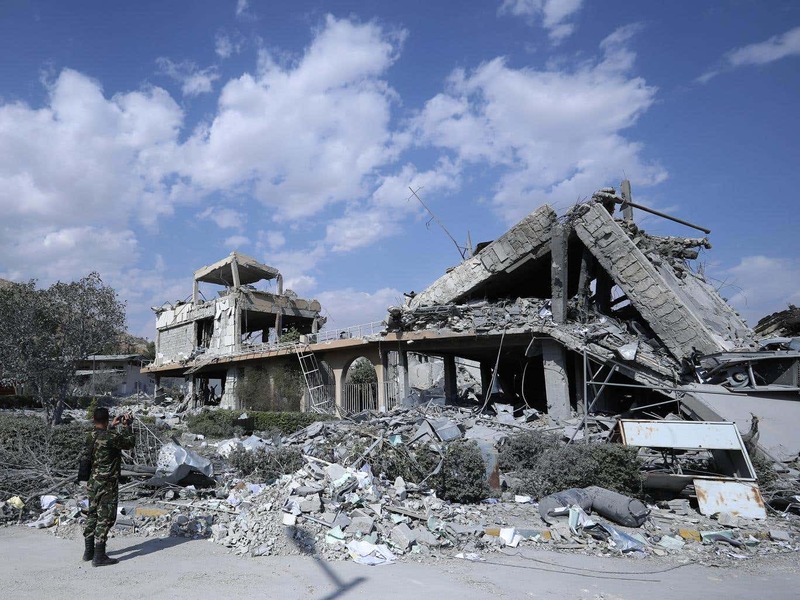 But the fact is that the Syrian armed forces remained untouched, and have kept all the means needed to win the war. As we will see in the coming weeks and months. Just pay attention to what is going to happen in the southern part of the Damascus governorate in the coming days. I don't believe RT. But Sertorio does. Maybe Russian batteries were jammed by electronic warfare measures. Russia is not in Syria to make war on the US, but to help the Syrian government reestablish full control over the country and defeat rebels and terrorists. This goal is being attained and the allied strike on Syria did not endanger that objective. It also did not endanger any Russians or Russian assets in Syria, as the allied countries took very seriously the Russian warning of retaliation if it had happened. So, Russia wisely prefered doing nothing. Or they did and kept silent about it. Some people believe that the high number of missiles intercepted were not the direct result of Syrian air defenses, but the result of Russian electronic warfare. If that's the case, Russia would rather keep it silent, so that the US would not make an extra effort to find defensive measures against such EW.